by by Nick Tumminello, C.S.C.S. Every time your feet leave the ground, quickly raise your toes upward. This will create a better “pop” on each jump and will help to strengthen your ankles. As your feet hit the ground, your goal should be to get back into the air as fast as possible. This will boost your explosiveness and help you to torch massive calories. The benefits are twofold: It forces you to move your shoulders through a full range of motions, and the palms-in position helps keep your shoulder joints in a safe, neutral alignment. Stand with your feet no more than shoulder-width apart and arms out to your sides at shoulder level. 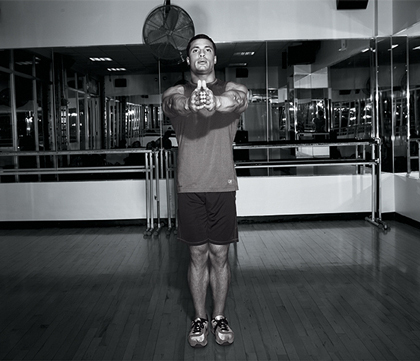 Cross your arms in front of your chest while jumping just enough to cross your right leg in front of your left. Repeat, crossing your left leg in front of your right. Stand with your feet together and your arms extended straight out in front of you at shoulder level with palms together. Jump into the air and simultaneously open your arms and legs.